Accounting for the use of funds and other resources. Knowing who is answerable to whom within the organisation. The accountability of the organisation to the wider community. It is often easier to clarify the first than the second and third, because funders and sponsors set targets and measures of outputs they require for their money. Who can stop someone doing something? Whose permission is needed for someone to act? If these questions give different answers, expect problems. Accountability of a partnership to the wider community is even more difficult to define. Is it best done by formal representation, or the way a partnership operates? See also Control, Representation, Terms of reference, Board information sheet. The process of setting up partnerships is complex, with seemingly endless lists of things to do. Action plans answer questions of: what do we do next? who does it? with what resources? Action plans may be complex plans covering a year or more, or the outcome of a decision-making meeting covering the next few weeks. Action minutes after meetings should ensure something happens, and clarify accountability. Later you will need more complex administrative and financial systems to run the partnership, comparable with any small business or effective public or voluntary body. Systems should established early, and be under the control of those creating or running the partnership. It is tempting to offload responsibility if some other body offers to take responsibility for admin or book-keeping, but a mistake. See also Outcomes, Team building, Vision. Aims are a written description of what a group or organisation is trying to achieve, and the objectives are the methods by which they may do that. The different interests in a partnership will all have their own aims and objectives &endash; so focus on where these overlap. Aims and objectives will be incorporated in the objects clause of the constitution. See also Agendas, Mission, Outcomes, Purpose, Vision. 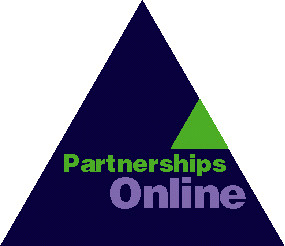 Have experience of working in partnership organisations. Can offer specialist knowledge, advice or other help in kind. Host meetings with key interests. Will act as a champion for your ideas. Partnership organisations like Development Trusts are engaged in activities which are unprofitable and for social benefit. If all their projects made money they could be carried out by commercial enterprises. In the early days these unprofitable activities may be paid for from core funding or projects grants, but this funding inevitably declines. One way to cover these long term costs is by vesting the Trust with an asset &endash; some land or buildings which can be let to generate revenue. Securing or creating these assets is one of the main concerns of trusts aiming for sustainability. Organisations are generally created by one set of people to benefit another. In for-profit companies the main beneficiaries are likely to be shareholders, if the organisation is run well. In non-profit partnerships, including Development Trusts, the beneficiaries are usually interests in the wider community. One sure way to keep the organisation on track is to keep asking: Who is it for? What value are we providing? Representing beneficiaries is one of the key roles of the Board of a Trust. Treat the bid as the start of business planning, if you are forming a new organisation. Aim for a mix of funding &endash; not just one source. Think through aims and objectives independently of the bid. Meet your own purpose as well as your funder's. Place the bid in a partnership-building process. Development trusts and other partnerships are often incorporated as companies limited by guarantee. The management committee is then a Board of directors, with responsibilities in company law. If the Trust is registered as a charity, the Board are also Trustees, with additional responsibilities under charity law. The Board should not see themselves simply as an advisory group for the staff, nor as just representing the interests of other organisations to which they may belong. They should be in charge of policy, and make key decisions in the development and running of the Trust. A term frequently used to distinguish change or activity among community interests (bottom up) from that in government (top down). Development trusts and other partnerships may start either way. What is important for a successful partnership is that wherever the process starts it leads to clear, shared objectives, respect and trust between different interests, and compatible ways of working. Throw up every idea you can. Don't discuss or reject any. Record ideas on a chart &endash; one idea may spark off another. When ideas dry up, cross off those agreed as ludicrous. Run a not for profit business. In order to achieve the first they need to do the second effectively &endash; so business management is a core competence. The projects, products or services provided by the organisation. The core staff, premises and equipment. The business plan should cover at least three years and show how fund raising and any income earned from projects covers the core costs. See also Companies, Constitution, Fundraising, Business planning information sheet. In planning to create a Development Trust or other partnership organisation, reading case studies of other projects may give you ideas for your own, although similarities are often difficult to see unless the case study is 'unpacked' around key issues. One way to clarify what you are trying to achieve is to try and write a case study of your own project as it might appear in a few years time. The success of a Development Trust depends substantially on the qualities of two key individuals &endash; the chair of the Board of directors, and the full-time executive director. During the early stages of creating a partnership you will need some champions. These are people who believe in the idea, promote it to others, and stay with you during the sticky patches. If they have influence and ways they can offer direct help, so much the better. Look for champions in public, private and voluntary sectors, and in the local community, who will bring others with them. Partnerships usually involve change: seeing things from other people's point of view, respecting into other people's ways of doing things and changing your own. This can be threatening, but it can also be enormously creative. It can painful, but it can also be fun. Either way it takes time &endash; which is why creating partnerships should be seen as process, not a structural fix. Most Development Trusts are charitable companies: non profit distributing companies whose objects enable them to apply for charitable status. The Board of directors are also trustees, and are unpaid. Any surpluses are retained within the company. See also Board responsibilities, Company, Trust, the Constitution information sheet. Charitable status adds credibility to an organisation, provides some tax benefits, and enables it to apply to large charities for funding. In general charities can only make gifts to other charities. There are, however, restrictions on trading and members of any management committee have substantial additional responsibilities as trustees. Development trusts and other partnerships may seek charitable status if their objects are charitable, they have an appropriate form, and are for wide public benefit. Not all regeneration work is charitable, and anyone seeking to create a Development Trust with charitable status should consult a solicitor specialising in the field. In order to overcome these difficulties, some charitable Development Trusts set up subsidiary trading companies. See also Charitable company, Legal issues. Tax. Trading companies. Stick charts up as you write them, so people can see early work. Keep charts or photograph them as a record. The centre line of partnership-building is gaining commitment. It depends on developing a shared vision, and some ownership of the ideas which are to be put into practice. That is best done by networking and running workshops to complement committee work and formal reports. Committees of partnership organisations can pose particular problems because almost inevitably people come from different background, and probably haven't worked together before. In order to overcome this, run workshops and organise socials. Check what they don't understand and research background. Turn up at the right time and stick to the agenda. Think before speaking and listen to other people . Partnerships depend on good communication &endash; both in the early stages when everyone has a different idea of what may be planned, and later when there are lots of projects and more people involved. Community is a term so widely applied that it is in danger of losing any meaning, like 'members of the public'. Aren't we all? At worst it may be used by officials to mean anyone who is not 'us' &endash; an undifferentiated mass of activists, organisations and uninvolved residents. Marilyn Taylor, in Signposts to Community Development, suggests it is more useful to think of a large number of over-lapping communities distinguished by the characteristics of their members, and the common interests which tie members together and give these characteristics a shared significance. Think beyond 'the community' to different interests. Consider the level of participation which may be appropriate. Use a range of participation methods &endash; print, events, workshops &endash; if you are aiming for more than basic information giving. Community Trusts are sometime confused with Community Development Trusts. However, Community Trusts are independent fund-raising and grant-making charitable trusts. Like Development Trusts they serve a specific geographical area, but unlike them do not generally carry out projects. If there is one in your area, they may be a useful source of information about community needs in the area, and may support community initiatives. Community trusts raise funds from a wide range of sources, especially those previously untapped, with the aim of establishing an endowment fund. Interest from this large sum of capital is used for grant-making in the area. The Association for Community trusts and Foundations will provide more information. A particular form of company, the company limited by guarantee, is increasingly popular as an organisational structure for larger community initiatives and partnerships. It is the most usual structure for Development trusts. Companies limited by guarantee do not have shareholders &endash; instead their members agree to pay a nominal sum, often only £1, if the company fails. The rights of these members to appoint members of the governing body &endash; the Board &endash; are defined by the constitution &endash; the Memorandum and Articles of Association. The company does not distribute surpluses as profits, but re-invests them in the company. If the members of the Board are unpaid, and the company has appropriate objects, it can seek charitable status. See Voluntary but Not Amateur, and Just About Managing? for more information on companies. See also Constitution information sheet. Successful Development Trusts display competence in five main areas: governance, management, communications, financial sustainability and project management..
See also the Competence information sheet, and others on each of these areas. Clarify aims and objectives, vision, and an action plan before drafting the constitution. Avoid using the constitution to resolve disputes. Consult a solicitor with experience of non-profit organisations if you are forming a company. See also the Constitution information sheet. They have clear briefs for specific project studies. They provide support and training around key issues. Development trusts may offer consultancy services in helping form new partnerships, and offer a wider range of consultancy services in order to generate revenue. Control in partnerships tends to lie with those who have the money, skills and administration &endash; however well intentioned they may be in seeking to involve others. For that reason partnerships formed around existing organisations may seem very unequal to other participants. One of the three main elements of the business plan of a Development Trust: the others are core funding and projects. Core costs will include staffing, training, premises and other overheads. With a staff of three or four these costs will be in excess of £100,000, unless some costs are covered indirectly through provision of help in kind and secondments. In its early days a Development Trust will require core funding to cover some or all of its core costs &endash; that is, funding which is not directly linked to any one project. Funders generally expect to withdraw or taper funders after three to five years, so a Trust will need to earn income from projects to cover core costs. Members of local authorities are essential allies in any partnership, and may be Board members of a Development Trust. Even if they do not play a formal part in Trust activities, it is important that they are fully briefed on its activities and the organisation as complementing rather than competing with their own role. 'Do local councillors see community based regeneration as a threat? Some do &endash; a lot do. To a certain extent this is a function of how they perceive power in their community and how jealously they guard that power. ' David Sparks, Association of Metropolitan Authorities, DTA conference 1995. Incorporated partnerships like Development Trusts which aim to regenerate neighbourhoods may face challenges over their accountability to local people, and calls that their governing bodies &endash; the Board &endash; should be democratically elected. Some trusts do hold elections, either within the community as a whole, or among local organisations. However, there may be tension between this desire for representation and the need to appoint Board members who have the confidence and competence to run a company, and possibly also act as trustees. Community based organisations working for the sustainable regeneration of their area through a mixture of economic, environmental and social initiatives. They are independent, not-for-profit bodies &endash; often registered charities &endash; which are committed to the involvement of local people in the process of regeneration and aim to be locally accountable in the work they do. They should not be confused with Community Trusts which are local fund raising and grant-making bodies. The process of setting up a Development Trust may well take a year and involve the equivalent of several days work a week. If funds are available the steering group for the Trust should appoint a development officer to carry out this work. He or she may or may not eventually become the executive director of the Trust. See also Development officer information sheet.